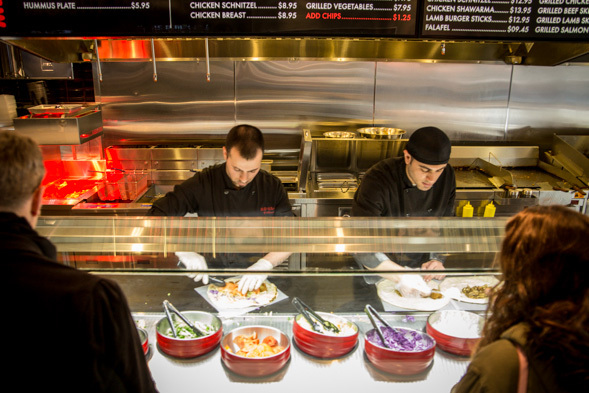 Me Va Me Kitchen Express is the new downtown offshoot of Thornhill's most prolific chain of Eastern Mediterranean restaurants owned by Albert Nachomov. 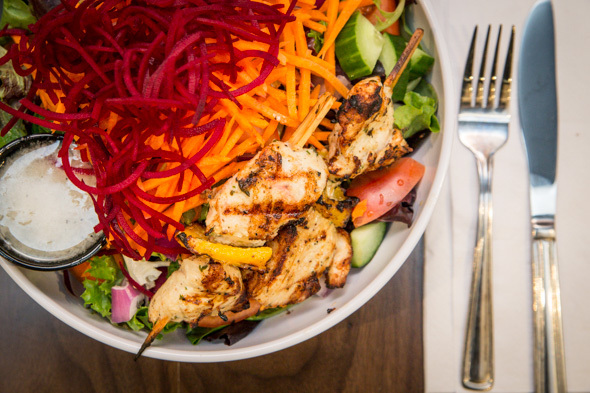 Distinguishing itself from the family restaurants north of Toronto, this new express concept is focused on fresh fast foods. 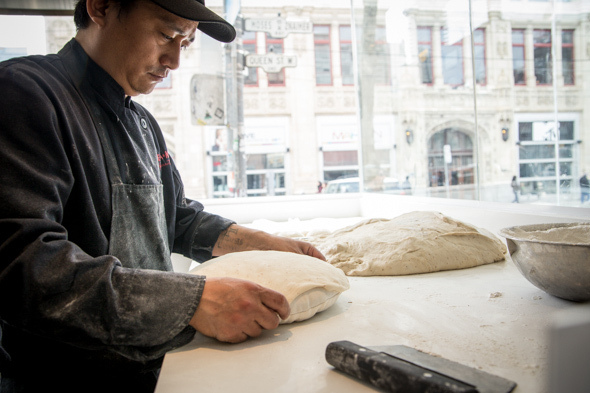 Formerly a branch of the Spring Rolls franchise, the space has been gutted, the kitchen moved up front, and two taboons installed upfront to showcase the fresh, hand stretched bread that's slapped to the side of the clay oven and baked to order. An informal dining area at the back of the restaurant can accommodate 90 and a soon to open patio down the side alley will add another 70 seats. Ordering is meant to be quick and convenient at the lunch counter upfront, though it's congested when I visit during the peak lunch hour rush. 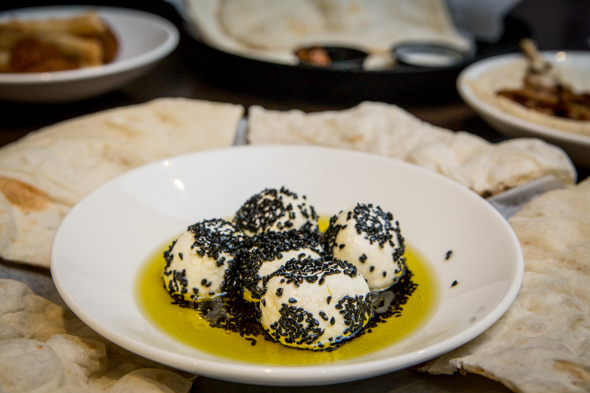 Signature mezze dips and spreads have been developed over 10+ years and include a creamy hummus ($4.45/8oz) that's blended with tahini and labneh ($4.95) so thick that it's formed into balls rolled in za'atar or black flax seeds and then packed in olive oil. This is how labneh is meant to be! Not so much a yogurt as it is a cream cheese. Grab and go dips are available to order fresh or pre-packed and refrigerated for takeout. Laffa wraps are kind of like the Middle Eastern answer to burritos. 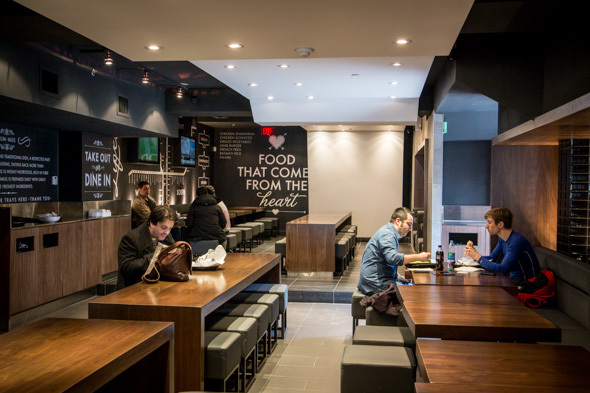 The handheld format is customizable with selections of falafels ($6.95), grilled chicken ($8.95), shawarma ($8.95), schnitzel ($8.95), lamb burger sticks ($8.95) or grilled veggies. Fresh toppings, house-made condiments and spreads are applied per individual specification, freshly fried chips on the side can be added for $1.25. Boxed meals ($9.45-$16.95) are built to order from a choice of proteins like the aforementioned meats plus an expanded selection of skewers. Each box comes with a choice of salad (house Greek or caesar) and starch (fries, basmati rice or grilled vegetables). I try the lamb burger ($12.95), a long kefta-like sausage comprised of ground veal and lamb, with the house salad made up of vibrant mix of greens with a lemony dressing served on the side. 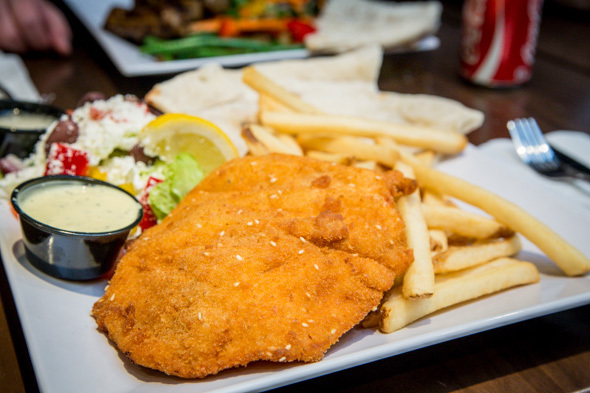 Schnitzel ($12.95) coated with sesame-specked breadcrumbs is fried golden and served with secret, slightly mustardy sauce. The oversized platter is packed with an obscene amount of food. Fries demonstrate little semblance to actual potatoes, though the Greek salad is exceptionally fresh and generously topped with feta. 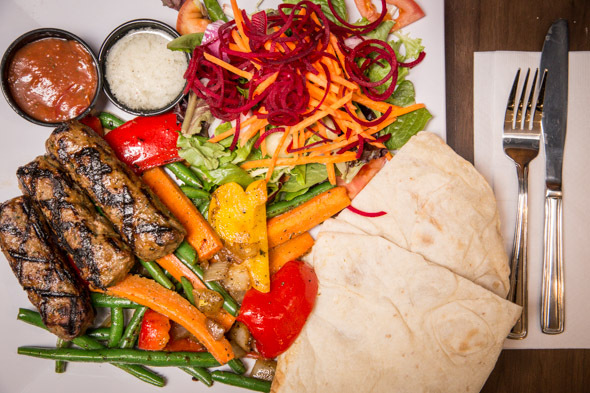 Meal-sized salads ($5.95-$6.95) can be topped with a choice of any two grilled brochettes priced additionally (($3.45-$6.95), though going carb-free disallows the eating all the fresh baked laffa possible, which is surely one of the main draws here. 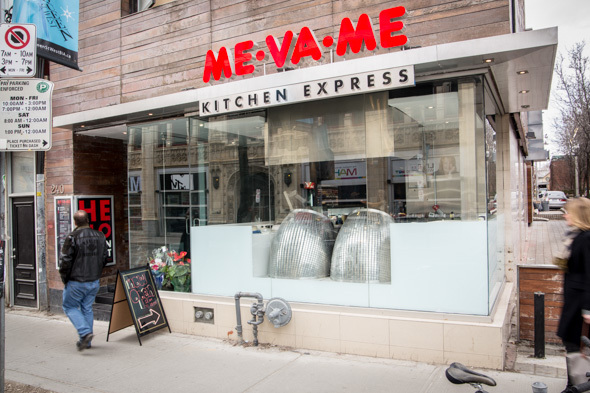 Me Va Me Express Kitchen is currently open daily from 11am until 10pm but hours might be extended in the future. Catering orders are welcome and suitable for corporate luncheons as well as shared family-style feasts.